The Polar Earth Observation group at the University of Leeds uses satellite Earth observation data to improve our understanding of ice sheets, glaciers and sea ice in the Northern and Southern Hemisphere. Loss of ice from polar latitudes can affect the Earths albedo, polar atmosphere and ocean circulation, and directly contributes to global sea level rise. Satellite data has revolutionised our ability to observe change in these remote and inhospitable regions, and our data records are now long enough to enable us to study the physical mechanisms responsible for driving these changes. We work closely with our national and international space agencies, and colleagues in UK and international research institutions. The University of Leeds hosts the headquarters of the Natural Environment Research Council (NERC) funded Centre for Polar Observation and Modelling (CPOM), led by Professor Andrew Shepherd. CPOM uses theoretical and laboratory-derived information to form new models of interactions between the ice, ocean and atmosphere, and uses ground and satellite observations to test these and other climate models. The CPOM Directorate is based at the University of Leeds, and we have researchers at the Universities of Bristol and Reading and at University College London. We also work closely with the British Antarctic Survey (BAS), National Oceanography Centre (NOC), National Centre for Earth Observation (NCEO) and European Space Agency (ESA). Our primary field of interest is using satellite data to observe the polar regions, particularly Synthetic Aperture Radar (SAR), and radar altimetry. 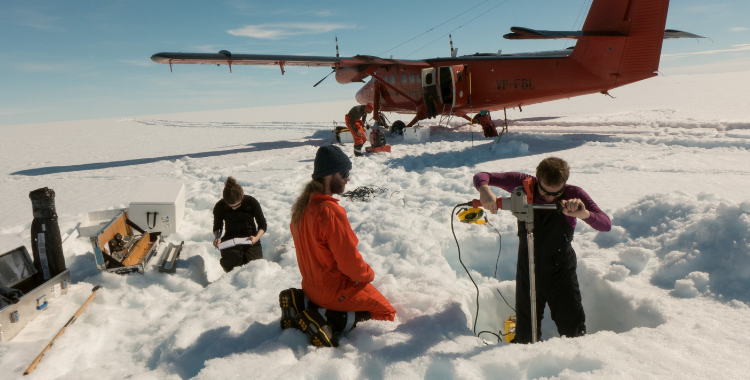 We track visible features such as crevasses to measure how fast glaciers flow, we use interferometry to measure tidally induced flexure if ice shelves at the ice sheet grounding line, and we use altimetry data to measure sea ice thickness and land ice thickness change. Satellites used by the group include ESA’s CryoSat-2, Sentinel-1, ERS-1 & 2, ENVISAT, and Sentinel-3. Andy Shepherd is the Principal Scientific Advisor to the CryoSat-2 mission, dedicated to measuring polar sea ice thickness and the mass balance of the Greenland and Antarctic ice sheets. CPOM has also led the development of the CryoSat Performance Monitoring & QA Service. In addition to our satellite based research, we also conduct fieldwork on the Antarcitc and Greenland Ice Sheets, and Arctic Sea ice. At CPOM we freely deliver satellite data to the research community and the public. Data portals are available for sea ice thickness, ice velocity and ice sheet thickness change. Research group members include: Dr Anna E. Hogg, Dr Rachel Tilling, Dr Debbie Rosen, Thomas Slater, Adriano Lemos, Ines Otosaka, Heather Selley.